The first tetrapods faced major problems in moving from the water on to the land. Air breathing was in fact not the key hurdle to cross, but rather weight and structural support. New modes of locomotion had to evolve, as well as new ways of feeding, of sensing prey and predators, of water balance and of reproduction. When all these problems of life on land are considered^ may seem surprising that vertebrates ever left the protection of the water. One classic theory (e.g. Romer 1966) was that fishes moved on to land in order to escape from drying pools. The Devonian was supposedly a time of seasonal droughts, and the freshwater fishes probably found themselves often in stagnant and dwindling pools. The conclusion of this viewpoint is that terrestrial locomotion evolved as a means of staying in the water! This suggestion has been criticized as there is limited evidence for droughts, and because the theory would explain only moderate terrestrial adaptations, not the much-modified tetrapod limb for example. A simpler hypothesis is that vertebrates moved on to land because there was a rich and untapped supply of food there. Waterside plants and terrestrial invertebrates diversified in the Late Silurian and Devonian, and it was inevitable that some group of organisms would exploit them sooner or later. A fish is buoyed up by the water and its body weight may be effectively zero. On land, however, the body is usually held up by limbs, and the skeleton and all of the internal organs have to become structurally modified in order to cope with the new downwards pull of gravity. The backbone of a fish is adapted for the stresses of lateral stretching and bending during swimming, but the main force affecting a tetrapod is gravity. The vertebrae and the muscles around the backbone have to become modified to prevent the body from sagging between the limbs. Tetrapods move in a very different way from fishes in water. Instead of a smooth gliding motion, the limbs have to operate in a jerky fashion producing steps to propel the body forwards. The paired fins of sarcoptery-gian fishes already had internal bones and muscles that produced a form of 'walking', although different in detail from tetrapod walking. But profound modifications had to occur in the lobed fin before it became a moderately effective land limb. The pectoral fin of the tristichopterid Eu-sthenopteron (Figure 4.1(a)) contains the major proximal bones of a tetrapod limb (Figure 4.1(b)): the single upper arm bone, the humerus, the two forearm bones, the radius and ulna. The tetrapod has additional elements in the wrist, the ulnare, the radiale and intermedium, and the centralia (singular, centrale), distal carpals 1-5, sometimes an additional bone at the side, the pisiform, and the four or five fingers, which are composed of metacarpals and phalanges. The limb bones of Eusthenopteron are to be found in early tetrapods, and indeed most of them are still present in our arms, although it is speculative to attempt to draw homologies for all of the bones of the hand and wrist. The tristichopterid pelvic fin also contains the basic tetrapod bones of the hindlimb, the thigh bone (femur) and the lower leg bones (tibia, fibula), but the tetrapod ankle bones (fibulare, intermedium) and digits cannot be identified. Although close anatomical similarities exist, there were major functional differences: Eusthenopteron could not have walked properly on land on its fins. 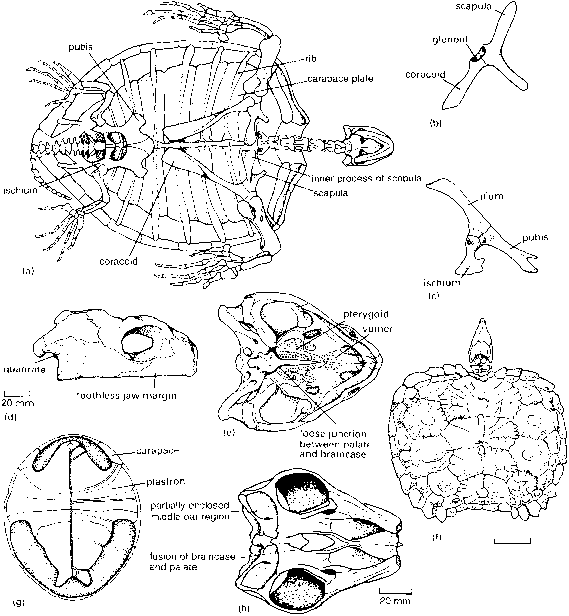 How can we compare the locomotor abilities of a tristichopterid and an early tetrapod? 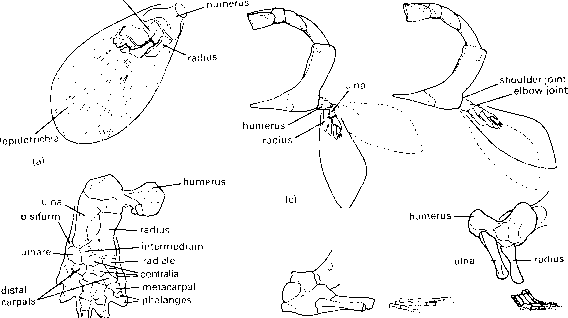 In Eusthenopteron, the limbs point backwards and a little sideways, and the limb skeleton could swing back and forwards through only 20-25° (Andrews and Westoll, 1970a). The main motion was at the shoulder joint, with a very slight elbow bend (humerus-ulna/radius hinge). The lepidotrichia of the remainder of the fin were flexible, and they might have increased the size of the swing, but only slightly (Figure 4.1(c)). In evolving the ability to walk, the tetrapod limb had to alter considerably both in structure and in orientation, when compared with the tristichopterid fin (Holmes, 2003; Shubin et al., 2004). New bones appeared, and the elbow and wrist joints became more clearly defined. The humerus lengthened and the shoulder joint swung round so that the humerus pointed partly sideways as well as backwards. The elbow joint became more of a right-angle and the lower part of the limb was directed downwards. The wrist acted as a hinge, and the new bones in the hand allowed it to spread out widely and fulfil its role as a weight-supporting surface. In walking (Figure 4.1(d)), the humerus swung back and forwards in a horizontal plane. During a stride, it also twisted so that the radius and ulna were swung down from a near-horizontal orientation. The limb girdles became heavily modified with the change in limb function. The pectoral girdle of most fishes is effectively part of the skull (Figure 4.2(a)) as the outer elements are attached to the gill and throat bones. When the first tetrapod used its pectoral fins in walking, additional forces were applied. At every step, the pectoral girdle takes up the impact of the weight of the front part of the body as each hand hits the ground. In a fishlike arrangement, these impacts would be transmitted from the pectoral girdle directly to the skull, and the whole head would reverberate in time to the walking steps. In addition, more flexibility is needed in the neck by tetrapods so they can snap at prey without twisting their entire body. 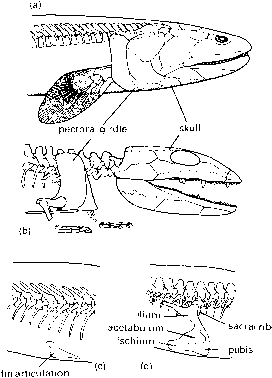 The pectoral girdle became separated from the skull in the earliest tetrapods (Figure 4.2(b)). a wheelbarrow, as the main driving forces in walking come from the hindlimbs, and the sacrum and pelvis had to become rigid to allow more effective transmission of thrust. The suspension is at the front, in order to keep the chest off the ground and permit expansion of the lungs. The earliest tetrapods had to modify the ways in which they fed and breathed. The skulls of osteolepiforms and tristichopterids were highly kinetic (see p. 72),but this mobility was largely lost in the early tetrapods. The jaw movements of tetrapods are also much simpler than those of most fishes. The lower jaw hinges at one point at the back of the skull, on a roller joint between the articular bone in the lower jaw and the quadrate in the skull. The first tetrapods presumably fed on small fishes and the increasing numbers of terrestrial invertebrates—millepedes, spiders, cockroaches, drag-onflies and the like. Air-breathing needs lungs, or some equivalent supported vascular surface, instead of gills. Lungs contain internal folds and pouches lined with heavily vascular-ized skin and bathed in fluid. Air is drawn in, passed into the fine pouches, and oxygen passes through the moistened walls into the bloodstream. Living lungfishes have functional lungs of course, and the same is assumed for osteolepiforms and indeed most other early bony fishes. The first tetrapods may have been only marginally better than their fish ancestors at air-breathing. There are two main modes of breathing in tetrapods, (1) costal ventilation,where the ribs and costal muscles expand and contract the lungs, and (2) buccal pumping, where air is sucked into the mouth and throat, and then rammed into the lungs by raising the floor of the mouth. Amniotes all rely on costal ventilation, but living amphibians use buccal pumping, and it is seen especially in frogs. Perhaps the early tetrapods breathed partly, or mainly, by buccal pumping—this is suggested by their broad mouths and short, straight ribs. Sensory systems had to change too in the first tetrapods. The lateral line system could be used only in the water (it was retained in many aquatic tetrapods). Eyesight was even more important on land than in shallow ponds (tetrapods have larger eyes than their precursors), and the sense of smell may have improved, but there is no evidence of that in the fossils. Early tetrapods had a poor sense of hearing in air, as did their ancestors. 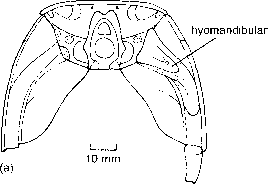 The main bone associated with hearing in modern amphibians and reptiles, the stapes, is present in early tetrapods (Figure 4.3), but it is too massive to be effective in hearing high-frequency sound.The stapes is a modified version of the hyomandibular element, which forms part of the jaw-hinging apparatus in most fishes (see p.51). A further physiological problem with life on land is the maintenance of water balance. In the air, water can evaporate through the moist skin of the body, the lining of the mouth and nostrils, and the early tetrapods risked desiccation. The earliest tetrapods probably remained close to fresh water, which they could drink in order to avoid this problem. Certain forms evolved semipermeable skin coverings that would have cut down water loss. into the adult form. 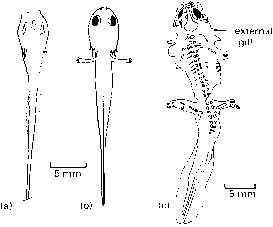 Fossil tadpoles are rare, probably because they are so small and their bones are poorly developed, but sufficient specimens have been found in Carboniferous and Permian rocks to confirm that at least some early tetrapods passed through larval stages similar to those of modern amphibians (Figure 4.4). What are the problem of land life in amphibian? What a the problem of land life in amphibians? How does support affects the life of amphibians on land? How do the amphibia solve the problems of living on land? How have reptiles solved the problem of life on land? What problems do amphibians experience on land? How have reptiles solve their problem on land? What are the tin amphibian need to solve land problem? How amphibians face problem for reproduction? What are the problems of live on land in amphibians? What are the problems of life on land for amphibian? What are the problems of life on land in amphibians? What are experiance of amphibians on the land? What are the problems amphibians encounter on terrestrial environment? What are the problem that amphibians faced on land and their solution? How do amphibians solve their problem of cannot reproduce on land except in water? What are the challenges face by amphibians on land.? What are the challenges face by amphibins on land? What are the challenges first be the amphibian on land.com? What are the challanges face by ampibian on land? What are problems encounter by amphibian on land? What are challanges facing by amphibiant on land? What are problem of life on land that were conquered by reptiles? What are the problems faced by vertebrates while they were emerging from water to live on land? What are the problem encontered by amphibian on land? What are the porblem enciunter by amphibian onland and how are the problem? What are the problems ancounter by amplibia on land and how are this problems been solved? WHAT ARE THE PROBLEM ENCOUNTER BY AMPHIBIAN ON LAND HOW ARE THIS PROBLEM RESOLVE BY REPTITES? What Are The Problems Faced By The Amphibians On Their Transition From Water To Land? What are the problem that are in contain by amphibians and how are those problem resolve? What are the problems encounter by amphibians on land and how are problems be resolves? What are the problem faced by amphibians in their transition from water to land? What are the problems of amphibians on land and how they are resolved.? What are the problem ancounter the amphibia on land and haw these problem solved? What are the problem face by the amphibians on their transition from water to land? What are the problems encounter by amphibian on land, and how can the problem resolved? WHAT ARE THE PROBLEM INCOUNTAL AMPHIBIAN ON LAND AND HOW PROBLEM RESOLVED BY REPTITES? What Are The Problem Encountered By Amphiblan On Land And How Are This Problem Resolved? What Are The Problem Encountered By Amphibian On Land And How Are This Problem Resolved? What are the problem encountered by amphibians on land and how are this problem resolve by reptiles? What are the problems encountered by amphibians on land and how can it be resolve by the reptiles? What are the problems encounter by amphibian on land and how are those problems resolved by reptiles? What are the problems encountered amphibian on land and how these problems resolved? What are the problems that encountered by amphibians on land and how are those problems resolved? What are the problem of amphibians on lands and how are problem desolve on riptiles? WHAT ARE THE PROBLEM ENCOUNTED WHEM MIGRATING TO PLANT LAND? WHAT THE PROBLEM ENCOUNTER WHEN MIGRATE FROM WATER TO LAND AND THEIR SUGGESTION? What avertebrate emerging from water to live on land? How vertebrates are solve the problem of transiting in land? How do amphibians overcome the challenges in terrestrial environment? What were the problems encountered by the first terrestrial vertebrates ,how did they overcome them? What are the key challenges faced by amphibians when transition from water to land? Why did amphibians move to land? How have amphibians solved the problems of life on land to? How have amphibians solve the problems of life on land.? Which problem of life on land are the amphibians unable to solve.? What could be an issue for amphibians while living on land? Do amphibains have problems with their lungs while living on land? What are the problems encountered by the amphibians living in land? How have amphibians solved the problem of life on land? WHY ARE AMPHIBIANS ARE UNEBLE TO SOLVE ON LAND? What are problems of life on land that were conquered by reptiles? What challenges facing amphibia in terrestrial life? What challenge face amphibia on land life? What are the challenges of life on land? What are the challenges amphibians face to terrestrial life? What are the problem encounter by the amphibians in transiting to living on land? HOW AMPHIBIAS TRASMITTED LIFE IN LAND? What is the problems that amphibians facing during respiration on land life?